Dental implants offer a durable, comfortable and permanent alternative to dentures. 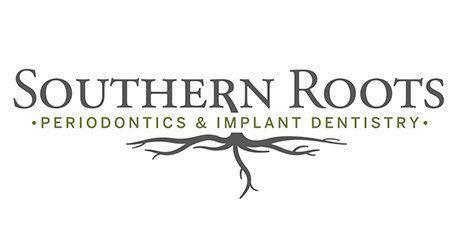 Southern Roots Periodontics and Implant Surgery offers a variety of implant options including ceramic dental implants for patients of all ages. Missing one tooth or many? Contact Dr. Brandon Frodge at his office on Dresden Drive for a consultation. Dental implants are used to replace missing teeth. A small titanium post is surgically inserted into the jawbone in place of the missing tooth roots. Once the area has healed, a porcelain tooth crown is attached to the post. In some cases, several months can pass between the time the post is placed and when the implant is attached to allow the bone to fuse to the titanium post. However, in other cases, new (but temporary) teeth can be placed in the space on the same day as the implant is placed. While dentures and bridges are acceptable ways to give patients the functionality of teeth without surgery, only dental implants function the same way as normal teeth. Because the titanium post becomes a part of the patient’s jawbone, the tooth looks, feels, and functions like a natural tooth. There is no slippage, no shifting, and no issues with eating, speaking or chewing. Properly cared for, dental implants can last a lifetime and have no impact on adjacent teeth. Implants may also cease the bone loss that is often associated with missing teeth. What are the Advantages to Ceramic Dental Implants? If a patient, for whatever reason, wants tooth replacement without the metal post, a ceramic implant offers a safe, effective alternative. It may also be useful for patients with a thin jaw bone or one who has a metal allergy. The surgical procedure to place a ceramic dental implant does not differ from that of implanting a traditional titanium post. However, ceramic implants offer an alternative post-implant with similar levels of bone regeneration, similar strength, and similar longevity. For more information about dental implants or to schedule a consultation with Dr. Brandon Frodge, contact Southern Roots Periodontics and Implant Dentistry.